In this age of the Internet, tweets, Facebook, and e-mail, we may not take time for today’s celebration: Thank the Mailman Day. Even titles like James Cain’s The Postman Always Rings Twice seem a bit arcane. Mine doesn’t even ring once. But there is at least one classic children’s book that owes everything to postal services around the world. Rather than going quietly out of print as it might have, the mail carriers of the world saved this book from oblivion. Jeff Brown began Flat Stanley as a bedtime story to his sons. He had discovered that one of them feared that a bulletin board in the bedroom would fall down during the night and crush him while sleeping. Of course, one of the best way to face fears, childhood or otherwise, is to laugh at them. So Jeff made up stories about what would happen if the bulletin board fell, and suddenly one little boy was squashed flat. Jeff’s son J. C. named the character Stanley Lambchop, a name he found wildly funny. 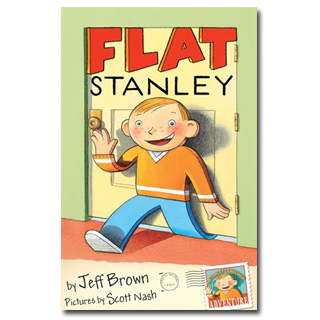 Being flat didn’t prove to be such a problem for Stanley. He could go places that other children could not. He could fly like a kite. He could take all kinds of vacations, simply by being mailed in an envelope. In 1995, an inspired third-grade teacher in Canada thought Stanley perfect for a letter-mailing project. She had her class place a Stanley drawing in an envelope and send him to family, pen pals, and friends, keeping a journal of all the places he traveled. A great idea, the project took off internationally and soon Stanley Lambchop became an international jet-setter. He also began to gain entrance into pretty fancy places. After security clearance, he visited the White House. He traveled on the Discovery space shuttle. He made an appearance at the 2006 Olympic Games, and Clint Eastwood proudly displayed him at the Academy Awards. Not bad for a character that began his journey as a way for a father to put young boys to sleep. So, for the triumphant journeys of Stanley Lambchop, we can thank the mailman. And for this delightful book we can thank Jeff Brown and his sons. If you want to participate in Thank the Mailman Day, just send Stanley to someone who’d like to hear from you! One day Stanley got a letter from his friend Thomas Anthony Jeffrey, whose family had moved recently to California. A school vacation was about to begin, and Stanley was invited to spend it with the Jeffreys. When Mr. Lambchop came home from the office that evening, he brought with him an enormous brown-paper envelope. The envelope fit Stanley very well. There was even room left over, Mrs. Lambchop discovered, for an egg-salad sandwich made with thin bread, and a toothbrush case filled with milk. They had to put a great many stamps on the envelope to pay for both airmail and insurance, but it was still much less expensive than a train or airplane ticket to California. Originally posted February 4, 2011. Updated for . About a year ago, a friend of mine sent an email asking if I would support a grade school student at her Massachusetts school for the Flat Stanley Project. The idea was each child had to get someone in a different state to do Flat Stanley. One student for every state in the nation. Well first, I quickly read a copy of Flat Stanley. Then I said of course I would do it. I was covered up with tasks at the time for various reasons but what the heck. I took photos of Flat Stanley at every single creative place I could think of in our area. Parks, the Zoo, a Santa Clause I found attending a private party, a large statue, well known sculptures, and the things I dreamed up even surprised me. I did about thirty shots with a short comment about each one. Susan sent an email saying the little girl kept asking her if she had heard from me. Talk about incentive! I told her I would get it there on time no matter what. It did take an overnight FedEx, . Her Flat Stanley was the last one in. Whew! Doing Flat Stanley was such great fun. The most fun I’ve ever had with a camera, and I love photography. I do need to go to the post office today! I love hearing about how authors come up with their ideas. For a dad to listen to his sons very real worries and create such a great story is awesome. It makes me happy for those kiddos who had Jeff Brown as a dad! I’m currently reading A Family of Readers by Sutton and Parravano and it’s making me look more closely at what goes into a story. This is an example of a book that comes from kids and helps kids deal with true things they are worried about. Love it! We had Flat Stanley come to our house once…I thought I posted it on my blog but I can’t find it right now. It was fun for us and fun for our friend who sent him. The second reason is that Jeff Brown was my uncle, one of my childhood idols growing up. Jeff was definitely in the category of “most fun adults.” He was the kind of guy who would spend a weekend building a 6 by 6 cement block swimming pool with friends and then have everyone pose around it (we won’t go into the inspiration for this project, but suffice to say that many of his workers had hangovers). What I remember the most about Jeff was his enthusiasm for things that would excite children (he raved about Disney’s Mary Poppins and predicted that Julie Andrews would win the Academy Award). And he never tired of talking about Flat Stanley no matter what age you were. An editor/publisher by profession, I don’t think he ever thought that Flat Stanley would last as long as it has, but I know he loved every fan letter he got. Peter: Thanks for sharing this. I had no idea that Jeff Brown was your uncle; but I can absolutely believe he was one of the “most fun adults” that you knew as a child. Until this post, Anita, I never heard of Flat Stanley – great story. Basically he went viral the old-fashioned way. I love this and I love Flat Stanley. My older son has read quite a few of his books. Most recently, he read one about Flat Stanley being a ninja or visiting a ninja! That was just last week or two weeks ago. I think I may be inspiring to do a read along on my blog, thanks to this reminder of such a fun project. Thanks for this great tribute to our mail carriers and Flat Stanley! My favorite part (beyond the kite-flying) was that Stanley was a hero — which was made even sweeter by the fact that he had been picked on and teased for being flat. I also remember the illustrations vividly, like the buttons of his pajamas popping off, the string and street grate scene, and the Little Bo Peep painting. Thanks for all of these great memories of one of my favorites! Anita, I love this story and have been sent many a Flat Stanley since moving to DC 18 years ago. Most recently my son who is 37 and lives in a group home with other disabled clients sent me a Flat Stanley. The group home director is always looking for ways to interest these moderately retarded clients in reading and exploring new subjects. They have taken to Flat Stanley like crazy! People in Little Rock are calling and offering to take Flat Stanley on trips with them, political dignitaries are wearing Flat Stanley to major events….my son and his friends are having a grand time with Stanley! This post was so inspiring I read it to my kids and Flat Stanley, a favorite in my house, will be mailed tomorrow. I was thrilled to have a project that appealed to my kids in today’s fast-paced, computer-centric world. They loved the idea of going to the post offfice and mailing Stanley, and to me, what was most important was that both boys felt very connected to Stanley and his journeys in a way that computer games (for all of their inventiveness) simply cannot reproduce. Perhaps I am showing my age here in that I prefer the old fashioned whimsy of this tale, but the simplicity of it and the way it grabbed both my and my kids’ attention and gave us a project do complete together — with real excitement– is something I fear we are really losing touch with. Thanks so much for this tidbit – I agree: Stanley may not be the most literary gem we have, but really, is that the only criteria for success? What else matters? I love this story!! We recently got to spend a lot of time with Flat Stanley as well as my family. My son and his 3rd grade classmates were reading the book and sending Stanley on his many adventures. We had a great time with him. He got to go the Winter Classic in Pittsburgh, PA. and was able to meet some wonderful people, like Jerome Bettis and Franco Harris, formerly of the Pittsburgh Steelers. Cudos to the maimen and women all over the world who take such good care of Stanley and carrfully get him where his next adventure will happen. What an interesting origin story! I do not have a bulletin board in my room, but I often fear that my bookshelves will fall over and crush me. I will think of Flat Stanley now when I worry about being crushed. Being 2-dimensional sounds more fun than being 3-D. I remember when my little brother’s class was doing the Flat Stanley project. He was so thrilled with it and the whole family got involved, incorporating Flat Stanley into various conversations. That name has such a hilarious ring to it, it’s hard not to say it every chance you get. I think that kids love the idea of Flat Stanley because they are given the chance to participate. Participation keeps them interested in an age when so many computer based toys and games are available to dominate free time. Also, Scott Nash’s illustrations are so charming!